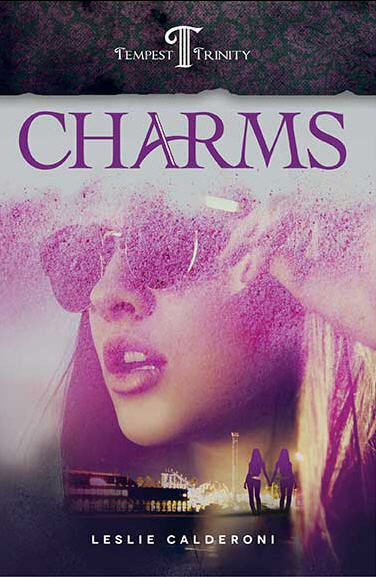 Charms is the first book in the Tempest Trinity trilogy, an exciting new Young Adult series set in the picturesque beach town of Santa Cruz, California. Emerald Tempest, and identical twin sisters Mia and Terra, are three teenage girls who have harnessed the power of physics. They use their charms to slow down and speed up time, interact with people no longer living, and alter the string vibration the world is made of. Emerald is blindsided by an unexpected attraction to Ryan, an intriguing boy from New Orleans, and just as she's getting to know him, family secrets and a menacing stranger complicate the sisters' lives. Tensions begin to boil over as the girls try to solve multiple mysteries and discover the extent of their growing powers. Charms is a smart and funny thrill ride that leaves readers wanting more with each chapter. The series itself offers strong female characters, aspects of physics that are presented with an exciting and fun twist, and adventure that keeps readers of all ages engaged. Romantic relationships are presented as complimentary and not defining, and the characters are inspirational in their commitment to individuality, friendship, and sisterhood. The author, Leslie Calderoni, is a strong proponent of girl power, the fun and magic of science, and writes with an engaging and humorous style. She's worked at high tech companies like Google and the video game company, Electronic Arts. She's a living kidney donor with three rescue dogs, Chili, Drama, and Cash, and lives less than a ten minute drive from the beaches of Santa Cruz where the story takes place. The second book in the trilogy, Conjures, will be available in 2016. The third installment, Blessings, in early 2017.